The Dreadnought Murderfang was found wandering the wastes of a planet within the Eye of Terror, having slain a hundred score Chaos Space Marines. What the Dreadnought’s name had been or how he had come to be there remained a mystery. But there was no questioning that the Curse of the Wulfen had taken hold, driving the warrior within insane with blood lust and feral savagery. Frozen with Helfrost weapons and brought back to The Fang, “Murderfang” is only unleashed when the need is dire. 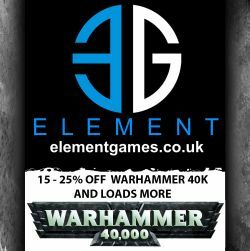 Murderfang is an Elites choice in the Space Wolves Codex. But unlike other Dreadnoughts, he is also a ‘Character’, which allows him to accept and issue Challenges in close combat. Strength 7, Ap2, Master-Crafted and Shred. So basically, you get a re-roll to hit in close combat and can re-roll all your failed to wound rolls. The high Strength and AP2 means you’ll happily murder Space Marines, Terminators and Monstrous Creatures. Although Murderfang’s Initiative of 4 may become an issue against the latter. His Murderclaws also come fitted with a Storm Bolter and a Heavy Flamer. You might use them. You might not. The Heavy Flamer is a nice to have though. Furious Charge, It Will Not Die, Rage, Rampage, Muderlust. Rage, Rampage and Furious Charge mean that Murderfang is brilliant in close combat, preferably cutting through whole squads of Space Marine equivalent infantry on his own. Although, he needs to be the one charging in order to make the most of all these rules. Especially when his Attacks can rise as high as 10! And he can go up to Strength 8 thanks to Furious Charge. It Will Not Die is a fun thing that’s nice to have. Murderlust stops him from becoming Stunned or Shaken, which is awesome, because it means he’s more likely to make it into close combat, which is exactly where you want him. Drop Pod: Yes! How else are you going to get him across the board? Considering Murderfang’s points cost, he’s a MUST HAVE for your Space Wolves army.He’s awesome fun to play and terrifying for your opponents to face. The only issue is that as an Armour 12 Dreadnought without any Smoke Launchers he’s likely to catch a Meltagun right in the face! So how do you keep him alive? 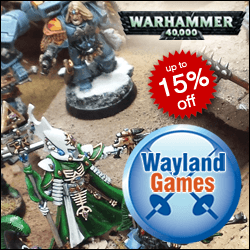 Drop Pod him in, alongside some other units and present your opponent with the difficult choice of targeting Murderfang (who is about to start rampaging through their army) or another unit that’s equally as scary. Although there’s nothing to stop you from hiding him behind his own Drop Pod in order to get a cover save of some kind. 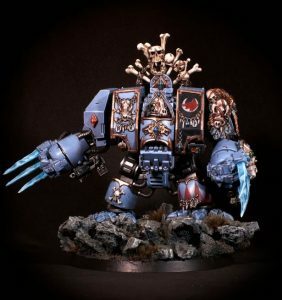 But Murderfang does answer the glaring issue with fielding Dreadnoughts – which is their need to be in close combat to avoid Meltaguns and Lascannons, but also their need for many more Attacks in order to actually win a close combat. Expect to see Murderfang in most Space Wolves armies for the foreseeable future. He’s awesome for his points and great fun to play.